It’s generally thought that the universe is “flat”, meaning that if you took an average of a the gravitational and dark energy curvatures, it would balance out to zero. In a perfectly flat universe, two laser beams aimed parallel to each other would remain parallel forever. If the universe were not flat, then the laser beams would eventually diverge or converge. Compare this to the surface of the Earth, which locally appears flat, but on large scales is a curved surface. If two people standing side by side started walking due north, they would eventually converge at the north pole. We see evidence of this flatness in the cosmic microwave background (CMB). Overall, the temperature of the CMB is very uniform. There are small variations in its temperature, but those small variations average out. This is exactly what we would expect with if the universe is (on average) flat. 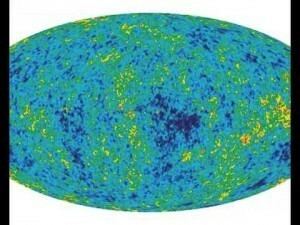 If the universe had some overall curvature, it would appear in the CMB as an asymmetry in the overall temperature. For example, one whole section of the background would be colder or warmer than expected by random chance. But recently we’ve found that there is a bit of an anomaly in the CMB. This result has been a bit controversial, because while it is a real and measured effect, its statistical significance is fairly small. The anomalies exist at a level of 3-sigma, which means there is only a 1% chance that they are due to random variations. In astrophysics we like to have new results at a 5-sigma level, or 1 in a million odds. So there are some who see this anomaly as a hint of some kind of new and exotic physics, while others (myself included, truth be told) who think we shouldn’t read too much into it until we have stronger data. While many proposals to explain this anomaly invoke exotic ideas such as multiverses, a recent paper in Physical Review Letters shows that the anomaly could be explained entirely by cosmic curvature. The team has demonstrated that the observed anomalies (if real) can be accounted for by a universe with a saddle shaped universe, seen as the left figure in the image above. If this is true, then it we will have to re-examine our understanding of the early universe. Our current model of the early inflationary period predicts that the universe should be flat, and so far that has held up. If the universe actually is curved, then the inflationary period must have been more complex than we have thought. I have hard time to imagine how something like a 3D space could be flat or curvef as the 2D surfaces in the image at the begining of this article. Or I missed something? The images are just a representation in a way we can visualize. Mathematically we can describe 3D space as flat or curved very precisely. We just can’t draw a realistic picture of it. So for what I understand, a closed universe is one where if you travel in one direction for long enough, you’ll return to the same place you arrived. 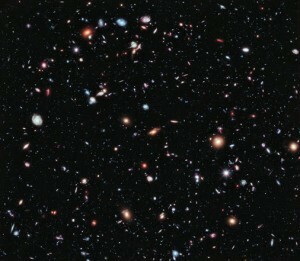 What would then be the nature of an open universe? One where space is “really” infinite? (as in, you can keep going forever) Or is it something else?